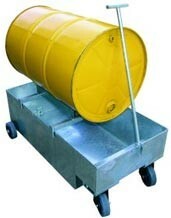 The TSC2 Trolley Spill Bin is designed to suit one drum. The drum is mounted onto the rack provided for easy drum dispensing. The spill bin is mounted on four 150 mm diameter wheels, 2 fixed and 2 swivel for easy manoeuvring. a drain plug is also provided for draining the bin. Galvanised finish.